15 Tips for Getting Started with the Clicker ... Read On! Training Tips Blog > 15 Tips for Getting Started with the Clicker ... Read On! 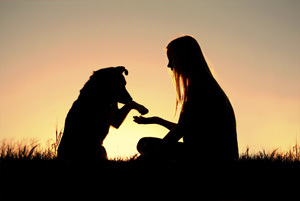 Clicker training is a terrific, science-based way to communicate with your pet. It's easier to learn than standard command-based training. You can clicker train any kind of animal, of any age. Puppies love it. Old dogs learn new tricks. You can clicker-train cats, birds, and other pets as well. Here are some simple tips to get you started. Push and release the springy end of the clicker, making a two-toned click. Then treat. Keep the treats small. Use a delicious treat at first: for a dog or cat, little cubes of roast chicken, not a lump of kibble. Click DURING the desired behavior, not after it is completed. The timing of the click is crucial. Don't be dismayed if your pet stops the behavior when it hears the click. The click ends the behavior. Give the treat after that; the timing of the treat is not important. Click once (in-out.) If you want to express special enthusiasm, increase the number of treats, not the number of clicks. Keep practice sessions short. Much more is learned in three sessions of five minutes each than in an hour of boring repetition. You can get dramatic results, and teach your pet many new things, by fitting a few clicks a day here and there in your normal routine. Click for voluntary (or accidental) movements toward your goal. You may coax or lure the animal into a movement or position, but don't push, pull, or hold it. Let the animal discover how to do the behavior on its own. If you need a leash for safety's sake, loop it over your shoulder or tie it to your belt. Don't wait for the "whole picture" or the perfect behavior. Click and treat for small movements in the right direction. You want the dog to sit, and it starts to crouch in back: click. You want it to come when called, and it takes a few steps your way: click. Keep raising your goal. As soon as you have a good response-when a dog, for example, is voluntarily lying down, coming toward you, or sitting repeatedly-start asking for more. Wait a few beats, until the dog stays down a little longer, comes a little further, sits a little faster. Then click. This is called "shaping" a behavior. When your animal has learned to do something for clicks, it will begin showing you the behavior spontaneously, trying to get you to click. Now is the time to begin offering a cue, such as a word or a hand signal. Start clicking for that behavior if it happens during or after the cue. Start ignoring that behavior when the cue wasn't given. Don't order the animal around; clicker training is not command-based. If your pet does not respond to a cue, it is not disobeying; it just hasn't learned the cue completely. Find more ways to cue it and click it for the desired behavior. Try working in a quieter, less distracting place for a while. If you have more than one pet, separate them for training, and let them take turns. Carry a clicker and "catch" cute behaviors like cocking the head, chasing the tail, or holding up one foot. You can click for many different behaviors, whenever you happen to notice them, without confusing your pet. If you get mad, put the clicker away. Don't mix scoldings, leash-jerking, and correction training with clicker training; you will lose the animal's confidence in the clicker and perhaps in you. Above all, have fun. Clicker training is a wonderful way to enrich your relationship with any learner.